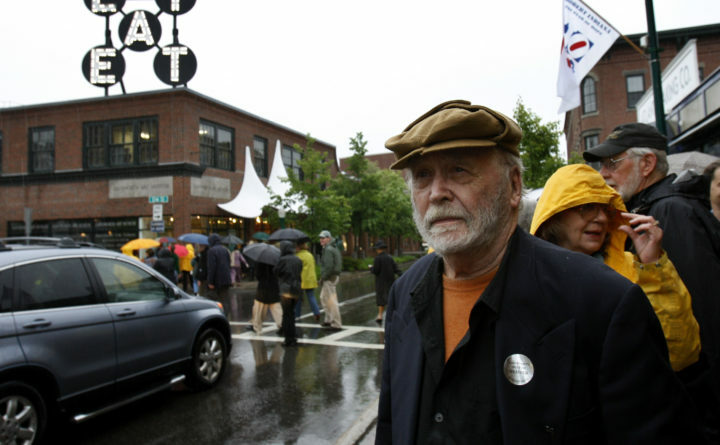 Artist Robert Indiana stands across the street from the Farnsworth Art Museum where his EAT sign was illuminated, Friday, June 19, 2009, in Rockland, Maine. Indiana never saw the sculpture lit after it went up at the New York World's Fair in 1964. ROCKLAND, Maine ― For the past nine summers, the word “EAT” has presided over Main Street. The 20-foot-by-20-foot sign stands atop the roof of the Farnsworth Art Museum, adorned with flashing marquee lights. It’s a funky and eye-catching addition to Rockland’s art-rich downtown. But admirers and passersby might not realize the sign is an art installation, Farnsworth chief curator Michael Komanecky said, let alone a sculpture by renowned pop artist Robert Indiana. Indiana died Saturday at his home on Vinalhaven, an island 15 miles off the coast of Rockland. Indiana, famously known for his “LOVE” series, was a native of the midwest and lived in New York before moving to Maine in the late 1970s. With Indiana calling Vinalhaven home for the past 40 years, the local art community remembered how the artist conveyed humanizing messages with his work, and the instances in which those messages were brought to Rockland. Komanecky first met Indiana more than a decade ago when he began a retrospective of the artist’s work that the Farnsworth hosted in 2009. The retrospective exhibit is what brought Indiana’s “EAT” sign to Rockland. The piece was first shown at the New York World’s Fair in 1964, but the sign’s lights were turned off after fair-goers mistook the sign for a restaurant, Komanecky said. Indiana never got a chance to see the sign illuminated at the World’s Fair. It would be 44 years later, on a rainy June night in Rockland, before Indiana got to see “EAT” in the state he envisioned it. Komanecky remembers leaving the Strand Theater ― adorned with its own marquee lights ― with Indiana on that night in 2009, when Indiana looked up at the Farnsworth across the street and saw his artwork lit and on display for the first time. While this would normally be the time of year when the “EAT” sign returns to Main Street, due to the legal processes surrounding Indiana’s estate, Komanecky said he is not certain when the sign will return to the Farnsworth. Over the years, two iterations of Indiana’s “LOVE” series have been on display at the Farnsworth. A large steel “LOVE” sculpture was recently hosted in the Farnsworth’s outdoor sculpture garden, before being moved to New York. A smaller “LOVE” sculpture is currently on display inside the museum. Indiana’s ties with the Center of Maine Contemporary Art, also located in Rockland, stretch back to 1970, when his “LOVE” series was exhibited by the museum, then called Maine Coast Artists, according to CMCA Director Suzette McAvoy. Indiana first came to Maine to attend the Skowhegan School of Painting and Sculpture in 1953, according to Komanecky. In the summer of 1969, a photographer for TIME Magazine invited Indiana to visit his cottage on Vinalhaven. By 1978, Indiana purchased the abandoned Old Fellows Hall on Vinalhaven, where he would live out the rest of his life. Drawn by architecture and nostalgia, Indiana felt that Maine was home, according to Komanecky. In a statement released Tuesday, U.S. Rep. Chellie Pingree, D-Maine, said she was able to get to know Indiana because she lives on North Haven. While only time will tell what Indiana’s legacy will be, Komanecky said he stands out among the pop art genre for the “new language of visual expression” he created with his work.